A new microfluidic device lets scientists identify a powerful drug from nature. A plastic storage crate filled with backyard dirt might have yielded the most powerful antibiotic discovered in decades. Employing a novel microfluidic device to grow soil bacteria, researchers in Boston and Bonn, Germany, say they have identified a new type of antibiotic that kills the bacteria that cause pneumonia, staph, and blood infections. The antibiotic, named teixobactin, has yet to be tested in people. But it cured mice of these infections, and it is so different from current antibiotics that the scientists, who reported their findings today in the journal Nature, said they hoped germs might never become resistant to it. Others said resistance to any antibiotic is inevitable, but they called the discovery important nonetheless. “It brings back the notion that there are lots of unanticipated surprises still lurking in the soil,” says Gerald Fink, a microbiologist at the Whitehead Institute, part of MIT. Other important antibiotics, including tetracycline and streptomycin, were also discovered in soil bacteria. But starting in the 1960s, it looked as if the earth might not give up any more of its natural defenses. That is because most soil germs can’t be grown in the lab and studied. Scientists switched to other approaches, but very few new classes of antibiotics have been discovered. With antibiotic resistance increasingly common, last year the World Health Organization predicted that this “discovery void” could lead to a post-antibiotic era, in which minor injuries and common infections could become killers again. The researchers discovered teixobactin using a new technology for soil prospecting that was developed by Slava Epstein, a biologist at Northeastern University in Boston. He devised a two-inch-long microfluidic chip that acts as a portable diffusion chamber. 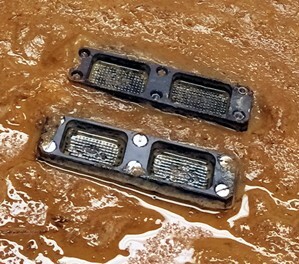 The researchers diluted dirt, including some from their own backyards, to capture a single soil microbe in each of 306 tiny holes on the chip’s surface. They then put the chip in a tub of dirt, allowing the germs to remain in their natural environment. “Essentially, we’re tricking the bacteria,” says Kim Lewis, the director of the Antimicrobial Discovery Center at Northeastern University, who led the research. Lewis says his team was able to grow colonies of bacteria robust enough to be transferred to a petri dish, where they could be tested to see if they produced antibiotics. “Apparently the bottleneck in growing bacteria is to achieve that first colony,” says Lewis. “Once that happens, they become domesticated.” Only about 1 percent of soil bacteria have ever been cultured, according to the researchers. Teixobactin appears to kill bacteria by binding to a fat molecule that is a building block of their cell walls. That’s an unusual mechanism, says Tanja Schneider, a researcher at the University of Bonn who worked on the project. Bacteria might not easily develop resistance to it, if ever. Other scientists say it is unlikely any drug could outwit bacteria indefinitely. “There’s not one single example where resistance hasn’t occurred,” says Henry Chambers, director of clinical research services at the University of California, San Francisco, and an expert on antimicrobial resistance with the Infectious Diseases Society of America. Still, if it proves safe to use in people, teixobactin could provide a fresh weapon to doctors. A study by the Pew Charitable Trusts in 2014 found that only 38 new antibiotics were in development by pharmaceutical companies, even though about 23,000 people die in the U.S. each year from drug-resistant bacteria. Teixobactin has been licensed to NovoBiotic Pharmaceuticals in Cambridge, Massachusetts, which collaborated on the research. Lewis says it will take about two years before the drug can be tested in volunteers.